Mittheilungen aus dem Gebiete des Okkultismus / Monatsschrift fur wissenschaftliche Begründung d. Okkultismus / Monasschrift fur okkultische Forschung. Berlin, and then Leipzig, Germany. Language: German. Publisher: August Weinholtz; Max Rahn; Linser-Verlag. Editor: Max Rahn. 1/1, May 1893-1926. 6 (rising to 8) Marks a year. 16-40 pp. (then 20 as a semimonthly publication), 7 x 9 1/2. The journal regularly contained photographs of leading workers in the fields of its interest, and occasionally (e.g., August 1901) carried wonderful plates of spirit art. The journal ceased as an independent publication in 1922 but continued until 1926 as a separately titled supplement included in Psyche (Berlin). The journal was begun as the organ of the Wissenchaftliche Vereinigung "Sphinx" in Berlin, of which Rahn was the permanent secretary, and gave considerable space in the early years to the club's sittings and experiments with mediums, including a materializing medium, Mrs. d'E from Sweden. The advertising on the back covers was usually devoted to journals and books but occasionally featured quack doctors and the likes of a Mrs. M.E. Williams from New York (a "Materialisations-Medium") for whom Max Rahn acted as agent. Articles by and excerpts from Carl du Prel (notably, on Eusapia Palladino), Theodore Flournoy, Ernst Haeckel, Justinus Kerner, Franz Anton Mesmer, F.W.H. Myers, Richard Wedel, Max Seiling, Alexander Wilder, Camille Flammarion, Jesse Francis Shepard (the American "singing medium"), et al. Extensive book and journal reviews and annual reports on the spiritualist movement. After the first years, the the journal turned increasingly to parapsychology and then to the occult. 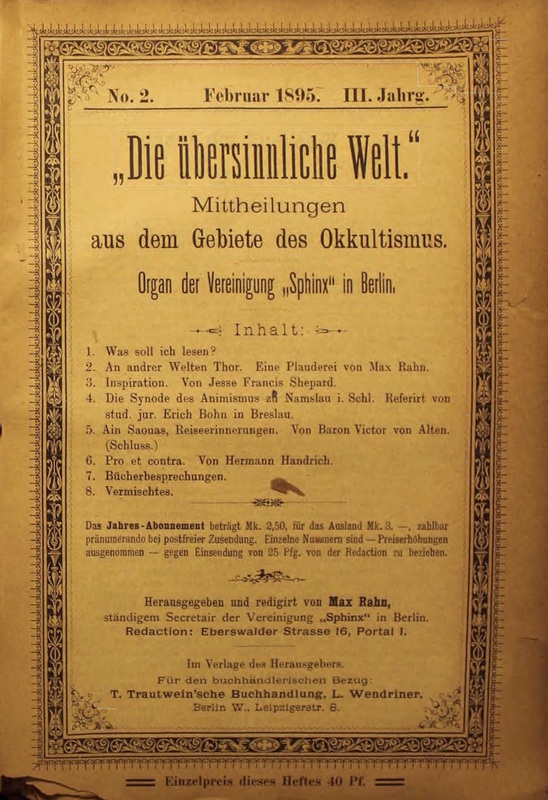 On Rahn and August Weinholtz (the publisher of the journal), who appear in many occult ventures of the turn of the century, see the notes under Das Wort, Prana and Sphinx. The former was said to have worked on the stock exchange and the latter was a supplier of parts for carriages. In 1896 they formed the Verband deutscher Okkultisten with Leopold Engel, and in 1901 Rahn, Weinhotz, Engel and Theodor Reuss announced in the journal their foundation (or revival) of the irregular Masonic Ludwig Lodge under a claimed charter from the Illuminati. This lodge in turn was amalgamated with the Swenborgian Rite and the Rites of Memphis and Misraim and eventually transmogrified into the O.T.O., the Ordo Templi Orientis. In January 1902, Ubersinnliche Welt included a 4 pp. special supplement called Oriflamme: Mitteilungen der grossen Freimaurerloge fur Deutschland, announcing the formation in Berlin of Holy Grail Lodge and Temple No. 15 of the Swedenborgian Rite, by Rahn, Weinholz, Engel and Franz Held. NYPL; LOC. ; Cornell University; ZDB: Freiburg Inst Grenzgeb Psychol; Munchen BSB; Munchen UB; Augsburg UB; Berlin UB Humboldt; Berlin SBB Haus Potsdamer Str; Worms StBi; GieBen FBB Germanistik; Leipzig DNB; Dresden SLUB, ZB.